No. 28, Lorong Sungai Puloh 10/KU 6, Kawasan Perindustrian Sungai Puloh, 42200 Klang, Selangor, Malaysia. After 60 years of growth, and today emerged as the largest mechanical power press in Taiwan. 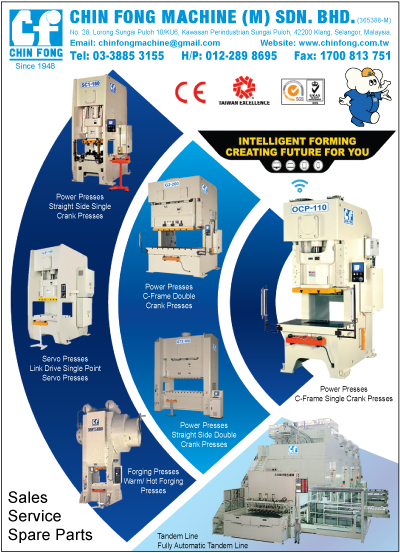 The biggest maker of the mechanical power presses in Taiwan, capable with the most powerful R&D ability; the worldwide service and sales net for the customer support are superior to the competitors, famous for offering the best quality products in the global press market. The road a company has to go to grow, has no end. Chin Fong has a vision to be a global player with our talent and professionalism. We know how to serve our customers bette .